The next major trendsetter was Louisiana born (1930) Little Walter (real name, Marion Walter Jacobs). His family moved to Chicago when he was a youth and while still in his teens he started playing with such bluesmen as Big Bill Broonzy and Muddy Waters, even though he was occasionally thrown out of clubs because of his age. He was influenced by Sonny Boy, and one of his earliest solo recordings (with Muddy Waters on guitar and Sunnyland Slim on piano) was an outright attempt to imitate the then best-selling Williamson sound. Later however, he evolved his own style which was a cross between city and country styles and which fitted in perfectly with the band of Muddy Waters, with whom he worked and recorded for several years. Muddy was one of the founders, if not the founder, of Chicago-styled R&B; his material was drawn from his Mississippi delta background, but had an updated sound-he used bottleneck style, bass, drums and Little Walter on amplified harmonica. As far as can be discovered, Little Walter was the first to record using this technique. The method was simple: he had his own amplifier and PA mike-he cupped both the mike and harp in his hands-with his own amplifier he had complete control of his sound. The amplification was born of necessity-the piercing guitars and drums completely drowned out unamplified harp-but it also added a new dimension, because of the various tone and echo effects built into the amps. Also, amplified harp could be used as a lead instrument, even with full volume backing. Little Walter was the first bluesman to use a chromatic harmonica regulary-up til then the Marine Band harp was the most widely used model. When amplified the chromatic gave a deeper-organ like sound. It had the advantage of being able to play in any key (theoretically), but the disadvantage of stiffer reeds, making the "bending" of notes, so necessary for the blues, much harder. But Little Walter mastered it and is one of the most musically creative of the blues harpmen. After leaving Muddy he fronted his own band, often doing instrumental numbers with a complex and inventive structure. 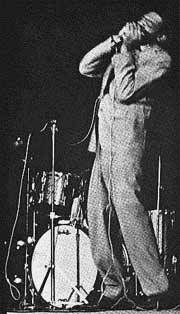 Little Walter continued to record and play live right up to 1968, when he died as the result of head injuries sustained in a fight. His style has spawned many followers and every R&B harpman owes a good deal to him. 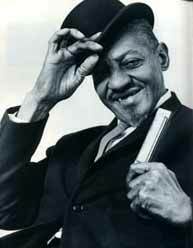 One of the best singer/blues harpists was Sonny Boy Williamson. He was born in Gledore, Mississippi, in 1897 (according to him) or Tallahatchie, in 1909 according to his passport. His real name was Willie "Rice" Miller, and his claim to be the "original" Sonny Boy is true in the sense that he is the older of the two. In 1938 he was broadcasting over the station KFFA in Helena, Ark, on a show called "Sonny Boy`s King Biscuit Flour Show", and although he claims to have recorded in the late 30`s, the first known recordings by him appeared in 1951 on the Trumpet Label, which was based in Jackson, Mis. Some his sidemen on these recordings were the well known guitarists Elmore James and B.B. KIng. With the success of these recordings he toured more widely in the North, settling in St. Louis in 1959. A year later he was working regularly in the Chicago area. He had a fantastic technique, made all the more effective by his sparring use of flashiness-he was in total control of his instrument at all times. He also toured around England and Europe, receiving warm receptions wherever he played. His songs were often pure poetry, both in words and music, and his work influenced many of the younger blues harpmen. He died on May 24th, 1965, of a heart attack, whilst playing a gig in Arkansas. Rice Miller taught himself to play the harmonica at age five and was playing for tips at local parties by the time he was nine. In 1938 he was broadcasting over the station KFFA in Helena, Ark, on a show called "Sonny Boy`s King Biscuit Flour Show", and although he claims to have recorded in the late 30`s, the first known recordings by him appeared in 1951 on the Trumpet Label, which was based in Jackson, Mis. Some his sidemen on these recordings were the well known guitarists Elmore James and B.B. King, he even taught his brother-in-law, Howlin’ Wolf, how to play the harmonica. With the success of these recordings he toured more widely in the North, settling in St. Louis in 1959. A year later he was working regularly in the Chicago area. He had a fantastic technique, made all the more effective by his sparring use of flashiness-he was in total control of his instrument at all times. He also toured around England and Europe, receiving warm receptions wherever he played. At this time he recorded with the Yardbirds and the Animals. His songs were often pure poetry, both in words and music, and his work influenced many of the younger blues harpmen. He died on May 24th, 1965, of a heart attack. However, his records remain as evidence of his pure, intense and beautiful reflections of the world he lived in, a world maybe made a little richer from the truths he told. This article was cobbled together from various articles but thanks are mainly due to Tony "Little Son" Glover (An Instruction Method for Playing the Blues Harmonica).